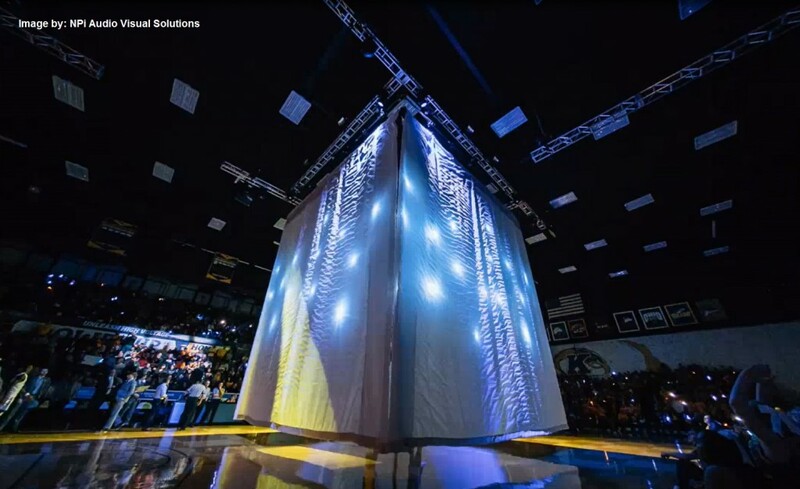 We simply LOVE getting to see footage of our rental and custom draperies “in action” out in the world, dazzling audiences far and wide during every type of special event, concert, production, performance, church show, and conference that you can imagine. 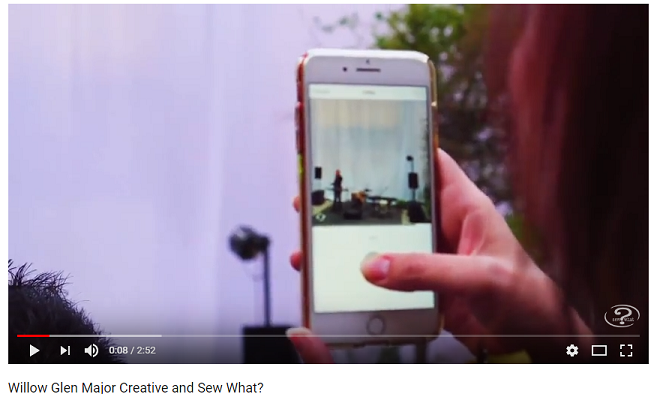 When our clients share videos and photos of our rental and custom theatrical drapery products with us (and also allow us to share them with our other clients to help give inspiration for other similar events), it always makes our day! Not long ago one of our incredibly inventive and artistic clients, BP Major (from Major Creative), came to us to help him find a way for he and his team to help “hide” the stunning property that they were hoping to conceal until the very last moment of WOW!…But he also wanted to be sure that the drape didn’t “darken” the event’s overall bright, stylish, and immaculate motif, either. He needed something that would be completely opaque, easy to set up, simple to operate, and still look absolutely marvelous to the crowd, both before and while curtain dropped. He ended up choosing one of our crisp and clean 23’h x 40’w White Poly Muslin kabuki-ready backdrops with our 10 head Kabu-Key Solenoid System for this big reveal. He set it all up in a very clever location on-site to better disguise some of the fabulous features of this upscale and utterly gorgeous ANR Signature Collection property being presented at his high-end, lavish party. As you can see, the video he shared with us was truly fantastic, and we were beyond delighted that it assisted in making the festivities a huge success. Contact one of our rental representatives today so that we can help you find the perfect drapery and theatrical products for your upcoming one-of-a-kind events, too. One of the most popular—and dramatic—special effects that our clients love to use time and time again for their special “reveals” are our rental Kabuki Solenoid Systems. Extremely straightforward to set up and execute, all you have to do is hang your soft goods from our solenoid heads, press a button, and watch the audience go wild when the drapes drop to the floor in a spectacular moment of flair. This is often used to reveal the band or some other wonderful surprise that has been hiding on stage the whole time. Originally these systems were primarily used for bands on stage wanting to add some excitement to an opening number…or be used as an effective way to add some “punch” to a special song. We have been renting these systems out for years in that capacity. However, more and more they are being requested to be used for special events and productions that we never would have imagined! Our innovative clients at USC Zeher Dance Group recently rented our system for a series of dance performances at competitions that helped them with an important aspect of their truly unique AV program, which wholly captivated their audiences. Utilizing our lightweight, easy-to-install, and highly dependable 6-head Kabu-Key Solenoid System, they used our kabuki kit to drop some of their own soft goods during a powerful and exciting part of the dance troupe’s performance, much to the amazement and delight of the hundreds of people watching at the competition. These kits are affordable to be used at all kinds of shows and special events, and can also be shipped anywhere in the country. They are a surefire way to make a completely unforgettable experience for your audience, as you can see in the video clip below. 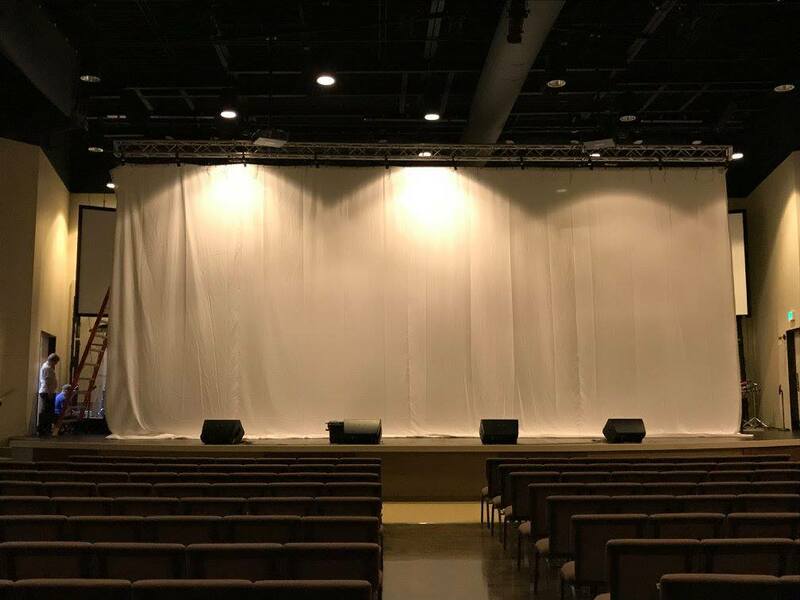 Our rental solenoid systems can be used with your own draperies, or you can use one of our kabuki-ready rental drapes or custom-built curtains for your unique event. Let our team of theatrical drapery experts help you design an incredible stage design at your upcoming exceptional production, too! Some of the biggest, most exciting stage productions taking place on stages right now are at churches all over the country. No longer are the days where parishioners sit quietly with their hands folded, listening to a pious person at the pulpit lecturing them on “all of their sins from the past week.” Nowadays these grand churches have larger than life shows, productions, and concerts that seek to truly excite their audiences, and fully inspire them to lead their best lives possible. And they are now showcasing some of the most dynamic stage designs, audio visual effects, and live musical performances ever experienced. We love being a part of these special events, and providing our customers with soft goods and theatrical stage supplies to help them create the most exhilarating shows imaginable. Recently we got to work with owner Mark Mealy and the creative folks at LightSound Productions. For over 30 years, they have been designing and providing audio, video, and lighting production and installation services at special events for churches, schools, graduation ceremonies, concerts, and everything in between. 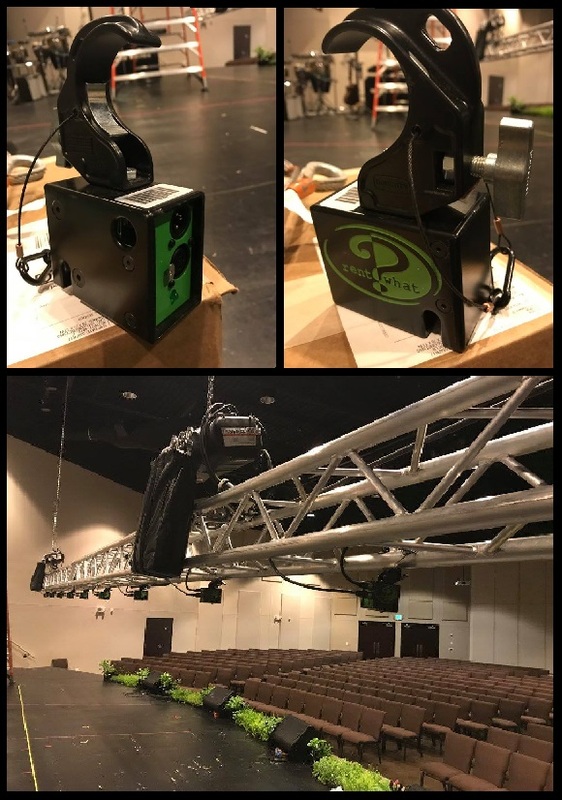 For this special occasion, they wanted something really dramatic to showcase a “reveal” at a local church’s Sunday services, and decided to use one of our dependable rental Kabuki Solenoid drapery release systems to truly surprise their audience. 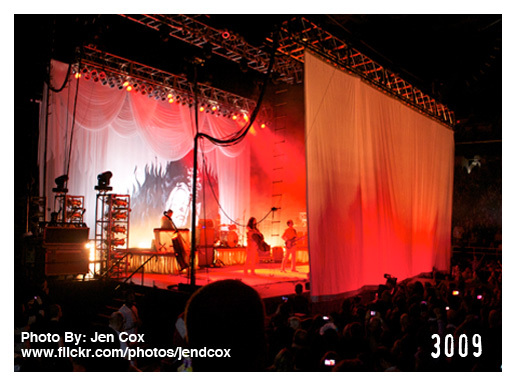 Starting with one of our rental 23’h x 40’w White Poly Muslin backdrop to project their video onto, they then used our 10 head Kabu-Key Solenoid kit to drop the drape cleanly and evenly to the floor at the perfect moment, revealing the band that had been eagerly waiting to come out and dazzle their audience. Easy to install, quick to ship, and affordable to be used at ANY special event, our rental Kabuki Solenoid Kits are a surefire way to make a memorable experience for your audiences, as you can see in the video clip below. LightSound did an exceptional job with this special church event, and we couldn’t have been happier to have been a part of it! Let our team of drapery experts help you design an incredible stage design at your next big special event or production, too. 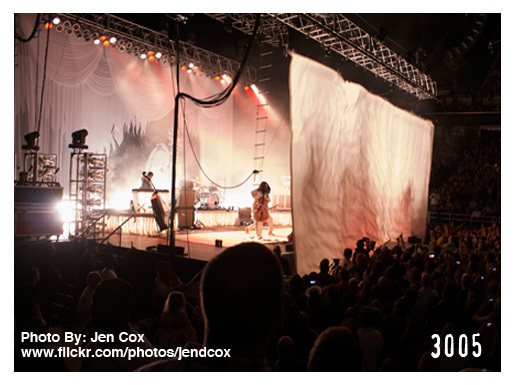 Nothing elicits quite the dramatic impact as building up an exciting reveal at a special event, trade show, or concert. Even more electrifying is when it is a Double Kabuki Drop…With the press of a button, the drape first drops from the truss so that it is now hanging down, thereby “masking” whatever secrets are hiding right behind it. Next, when the time is perfectly right, the drape falls to the floor with another press of a button, revealing the mystery that has been waiting right behind–to amaze and delight everyone watching. No one knows this more than the innovative team of creative production designers at Vincent Lighting Systems (VLS). Lead by Production Manager Derek Hons, VLS has dazzled their audiences for many years with their inventive event designs and one-of-a-kind set configurations. But they have also truly mastered the “art” of the successful kabuki drop by using our rental Solenoid Kabuki Kits for all kinds of special events. 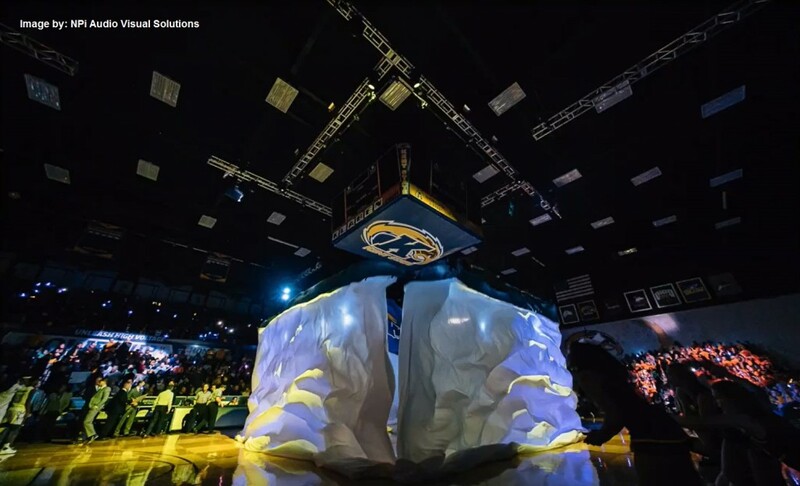 Recently, VLS has been working with the Kent State University Communications and Marketing department by orchestrating some pretty sensational presentations at their men’s basketball home games, which really helped to whip up their fans into an actual frenzy! 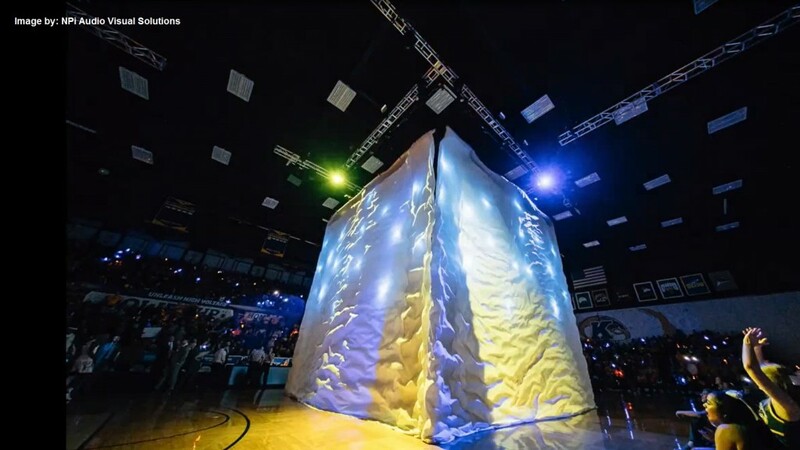 Utilizing our rental Double Drop Kabuki System, with two of our perfectly suited rental 30’h x 60’w White Poly Muslin backdrops, they were able to design an incredibly provocative “cube” of projected video, lights, and music. They also worked with the brilliant technicians at NPi Audio Visual Solutions to create a truly unique AV program that completely captivated their audience. 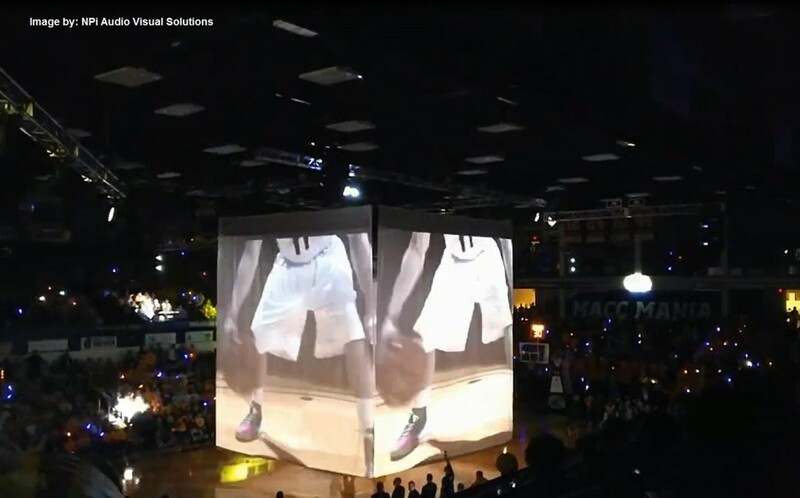 This was then all displayed on the basketball court much to the delight of the team’s very enthusiastic fans. As you can see by this phenomenal video, the end result turned out to be absolutely spectacular! Let our team of drapery specialists help you with the ideal rental soft goods and theatrical supplies to design your own unique special event, too. Here are a few excerpts from a wonderful white paper that we have on our website discussing “The Ins and Outs (and ups and downs) of the Kabuki”. If you have ever wondered about this simple yet highly dramatic effect then you will love the full article. A Single Kabuki allows a single release – the drape is hanging, the solenoids are released, and the kabuki drops to the ground. Solenoid-based kabukis are a dramatic way to showcase a backdrop or drape. Our solenoid system is remarkably easy to install. 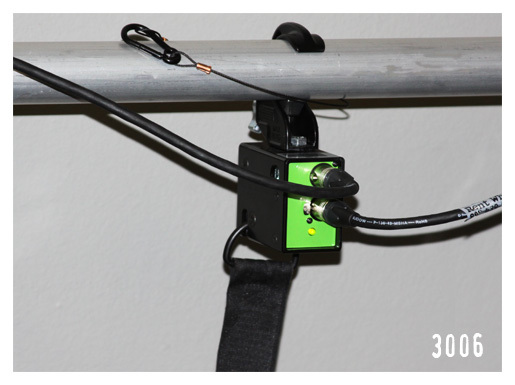 Simply clamp our drape ready solenoid heads to the truss or pipe, and connect with the supplied cables. 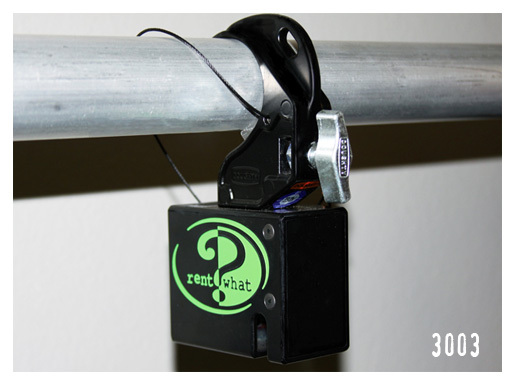 You can position the “go” button anywhere on stage to deploy the drape drop on cue! Here is an image of what the solenoid heads look like – they are compact and easy to install. Performance that Rocks! You’ll be impressed by the look of our rental kabuki drapes! Here is a video medley showing kabuki drops in use for a variety of stage projects. Check out our online Portfolio of Past Drapery Projects. You can also see what exciting events and concerts are currently showcasing Rent What? rental draperies by visiting our Press Room.